For those who live to be outdoors, are always down to go hiking, & are often described as “up for anything”, this adventure is the perfect one for you! 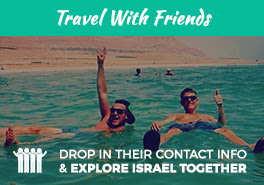 Connect with nature and see Israel from a captivating and unique new perspective with us during the summer seasons! Conquer Israel’s National Trail as you trek through the alluring landscapes of Israel & explore the wide array of cultures, people, narratives & so much more. Get ready to discover challenging hikes, experience thought-provoking encounters, & connect to the epic adventurer in you on this invigorating journey. This trip runs exclusively in the summer months. Being able to bond with ten Israelis, over the course of ten days. helped me to gain a better understanding of [Israel]. also now feel more connected to the land because I am so close to the people."